SeaWorld announced on March 17, 2016 that the company will end all orca (killer whale) breeding now. It will also introduce new, inspiring, natural orca encounters, rather than theatrical shows, with focus on orca enrichment, exercise, and overall health. Those change will start in its San Diego park in 2017, followed by San Antonio and then Orlando locations in 2019. The postcard, purchased at a local stamp show, shows Orky and Corky, the only pair of mature breeding Orcas at Hanna-Barbera's Marineland in Rancho Palos Verdes, California. They were receiving a fraction of the some 450 pounds of fish as their daily consumption. 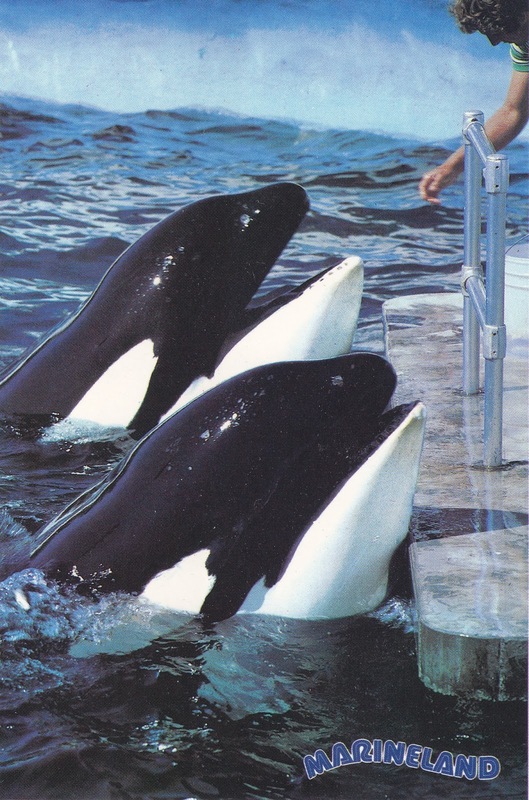 Marineland, first opened in 1954, was purchased by the owners of SeaWorld San Diego in 1987. The new owners moved these popular killer whales and other animals to their San Diego facility and abruptly closed Marineland. The current changes come as a result of the pressure from animal rights groups in protesting SeaWorld for its treatment of the killer whales and other sea mammals in captive. Now, Seaworld will have to ponder its own fate: how to survive without orca shows?